Even making a horse rear like this can be dangerous, so it’s best left to a trained equestrian—like young Steffi Epper here! 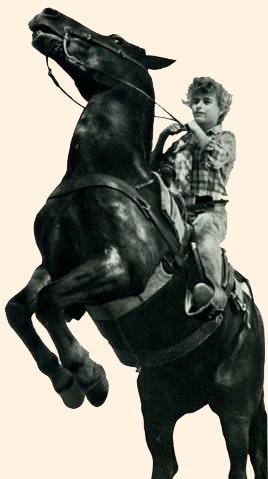 While Johnny Washbrook became a very capable rider—especially with Flicka--there were many horseback stunts during the series that had to be performed by a stunt professional. Just as Flicka had her stunt double in Goldie, Johnny had a wonderful stunt double in the very skilled young STEPHANIE EPPER. Johnny, a self-admitted “city slicker” from Toronto, had very limited riding experience before being hand-picked to star in the series. For several weeks prior to filming, he trained on Flicka, riding her every day with horse-trainer Les Hilton riding alongside and instructing him. Steffi Epper, on the other hand, was practically “born in the saddle,” and she was a good match for Goldie, who was harder to control than Flicka. The studio had to cut Steffi’s hair and dye it chestnut so that she would more resemble Johnny in her stunt scenes. A press release from CBS Television on May 16, 1956 titled “Johnny Washbrook's Stand-In is a Girl; Star of ‘My Friend Flicka’ Shrugs It Off" stated “At an age when the War Between the Sexes reaches its most embattled stage, Johnny Washbrook is faced with a situation that would make most kids his age go hide in a tree. Johnny—who stars in CBS Television’s “My Friend Flicka” series—has a girl for a stand-in! To the older gentry, for whom the battle of the sexes has relaxed into a frequently humdrum war of attrition, this may not seem too important. But to a boy, such a state of affairs abounds with frightful significance. Not Johnny, however. 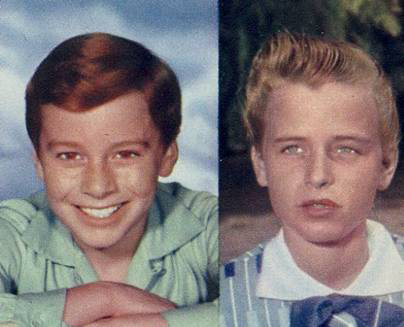 The personable, red-headed young star of the "Flicka" series appears to be made of sterner stuff than most boys his age. "A-a-h," he says, with a shrug, "who cares?" And close observation of Johnny and his girl stand-in, whose name is Steffi Epper, seems to bear out that he doesn't really mind. There is a certain amount of acrimony between the two, but certainly not what one might expect of a pair of 10-year-olds in the same circumstances." “The circumstances are these: “My Friend Flicka” (CBS Television, Friday, 7:30-8:00 PM, EDT) is produced, though not broadcast in color. Since Johnny’s hair is red, and there are varying shades of red hair, it was necessary to match the star and his stand-in pretty closely. Steffi’s hair is just the color of Johnny’s, and—being tall for her age—she’s roughly the same size as Johnny. What’s more, she can ride, which made things easier, since much of her job is performed on the back of Flicka, a handsome red-haired horse. Steffi’s riding ability caused Johnny some concern during the earliest days of production of the series, since Johnny didn’t ride at all. But this same concern apparently had a salutary effect on the lad; he has applied so whole-heartedly to the task of learning to ride that he is now, only a few months later, an excellent horseman. 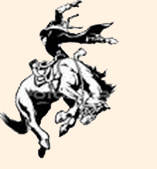 her horseback acrobatics by jumping into the arms of her dad, famed stuntman John Epper. Aside from this, the rivalry between the two seldom extends beyond an occasional Indian-wrestling match, a tug-of-war with a disputed candy bar, or one’s effort to trap the other with an old gag… Earlier in their professional association, there was a little physical debate between the two, in which Johnny was able to demonstrate his masculine superiority. But, being essentially a chivalrous moppet, he has since never attempted to continue asserting it. It may be of course, that Steffi, being a girl, was careful to arrange the outcome during that early trial by combat. But it would not be politic to suggest this to Johnny, or even to hint at it by asking him. This must remain Steffi’s secret.” This press release erroneously stated that he was 10 years old, but at the time he was 11. In the extremely macho male-dominated film stunt industry where men often dressed as women to double for female actresses, Stephie was the exception in this early television series—a girl who dressed as a male to double for a boy. specially reinforced and padded clothes, this trick is still dangerous (and very uncomfortable). She’d earn $350.00 for this stunt. Stephanie’s father was professional movie stuntman John Epper (1906–1992), a Swiss immigrant who was a stunt double for stars like Gary Cooper, Randolph Scott, Henry Fonda, Errol Flynn and Ronald Reagan. 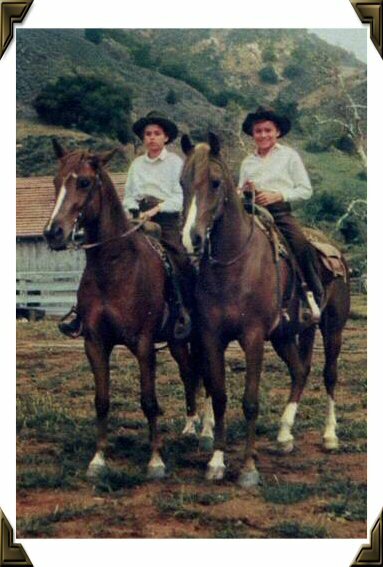 With approval from their mother Frances, an actress, John taught his daughters how to ride at an early age. Stunt riding was a family tradition with the Eppers, and virtually all of them were in the business. In fact, the remarkable legacy of the Epper stunt family continues to this day with some of John’s great-grandchildren. The dynasty has included Stephanie and her sisters Jeannie and Margo Epper, brothers Andy, Tony and Gary Epper, and John’s grandchildren Eurlyne, Kurtis, Heidi, and Richard. astride Flicka in a publicity photo shot in Malibu Canyon for TV Guide. Stephanie would use her own well-trained and patient mare Ginger, or one of the other horses from the family ranch, to train on. When she reached high school age, she was trapped for a while by the fact that she was too big to double for children, but couldn’t quite yet complete with older stunt women who didn’t have to go to school too. But she soon overcame that handicap, and continued in successful stunt work through the 1980’s. Both Stephanie and her sister Jeannie were Charter Members of the Stuntwomen’s Association of Motion Pictures (SWAMP) when it was founded in 1967. Sister Jeannie is a past President of that organization, and was recently quoted as saying, “I’ve been doing stunts for almost fifty years. It’s all I really know, outside of being a mom and grandma. Retirement’s not for me.” Stephanie, Jeannie, Gary, Tony and Margo have all been inducted into the Hollywood Stuntmen’s Hall of Fame. The Eppers stand out as some of the most highly-respected members of the professional stunt community. behind galloping horses, and—as shown in this shot—‘toasted’ in barn and stable fires. In the decades since My Friend Flicka, Stephanie Epper’s talents as an actress, stunt double and stunt coordinator have enriched the quality of many other popular television series and many major motion pictures. Her stunt credits include many motion pictures, including It’s a Mad Mad Mad Mad World (1963), Cheyenne Autumn (1964), The Great Race (1965), Little Big Man (1970), Valdez is Coming (1971), Soylent Green (1973), Blazing Saddles (1974), The Towering Inferno (1974), The Blues Brothers (1980, Smokey and the Bandit II (1980), Doctor Detroit (1983), Beverly Hills Cop (1984), Body Slam (1987), Nightmare on Elm Street 5 (1989), Total Recall (1990) and many more. The large Epper family’s stunt heritage and its members’ unequivocal reputation for professionalism seem likely to carry on for generations to come. She was also a stunt double for Amanda Blake (“Kitty”) in TV’s Gunsmoke. Over the years, stunts like falling off of horses, fights, and runaway wagons became routine for Stephanie Epper. She learned her lessons the hard way. In films, she performed many other types of stunts, like being knocked down by cars and dropped into the sea by a helicopter. One early injury came when she was bounced out a jeep speeding off-road as it hit a large rock. She had taken another stunt person’s word that the ground they were going to travel had been examined. After that, she became meticulous in checking all the details of each stunt herself beforehand. Retired from films now, Stephanie and her husband live in Oklahoma. Johnny Washbrook’s family became close friends with the Epper family, and they would often meet at each others’ homes and barbeque together. Johnny still has a lot fond memories of working with Stephanie, and having fun with her and her brothers. Click here to visit the Internet Movie Database (IMDb) to review Stephanie Epper's Filmography data. Journalist Loretta Kemsley of Los Angeles, who was a stunt double in the 1950s, says that she remembers Stephanie Epper and that she was often called ‘Stevie.’ “Her sister Margo and brother Tony also did stunt work. They were all older than I was, and I didn’t know any of them well. I believe my older brothers did.” She went on to relate that Les Hilton (trainer of Flicka, Mr. Ed, and many others) lived across from her family in North Hollywood when she was growing up. She says that he moved to Burbank when she was eighteen, about the same time her own family moved. 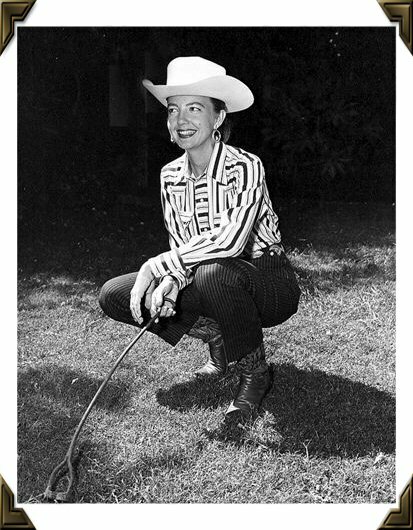 She had a great deal of respect for Hilton, calling him “a wonderful man and a very talented trainer.” Loretta, herself began as a young horsewoman and stunt rider in the 1950s for cowboy star Gene Autry’s Flying A Productions studios. 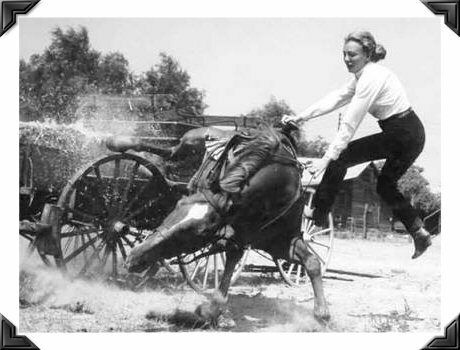 In June 1954, at the age of eight, she began working as a stunt double for Nancy Gilbert, who played young Calamity Jane in the NBC television series, Buffalo Bill Jr. Forty more episodes were later co-produced by Autry for this children's western, through 1956. The tough and talented Martha Crawford-Cantarini cuts a comely figure in her western attire. 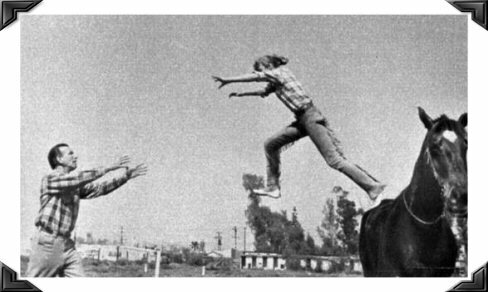 Famed stuntwoman MARTHA CRAWFORD-CANTARINI doubled for Anita Louise (as character Nell McLaughlin) in the My Friend Flicka series, and she indicates that she had a great working relationship with Anita the whole time. Anita didn’t have a lot of action scenes in the series, but when she did, Martha was there to do them. 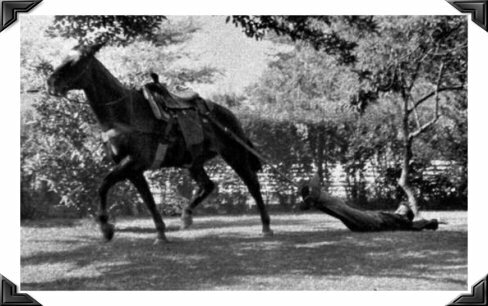 Martha’s own horse, Jim, did the free jumping scenes, like jumping over a fence out of the corral. Martha had a long and very successful career performing horse stunts in both motion pictures and television. Trying to break into films as a young starlet early on, she lost a screen test to another nervous young blonde—Marilyn Monroe—but it was a blessing in disguise, for it caused her to follow a dream and do what she really wanted to do with her life. 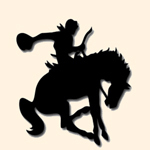 She began a long successful career of horseback stunt riding for the stars. During her career, she also doubled for Shirley MacLaine, Carroll Baker, Linda Darnell, Rhonda Fleming, Debra Paget, Anne Baxter, Jean Simmons, Claudette Colbert, and many other actresses and actors--performing feats with horses that needed to be done with a relative amount of safety by an expert and experienced horsewoman. Martha has worked with, and kept, horses all of her life, and loves and respects them. She has saved movie horses that studios were ready to sell off to the “glue factory” after they had outlived their usefulness in films. 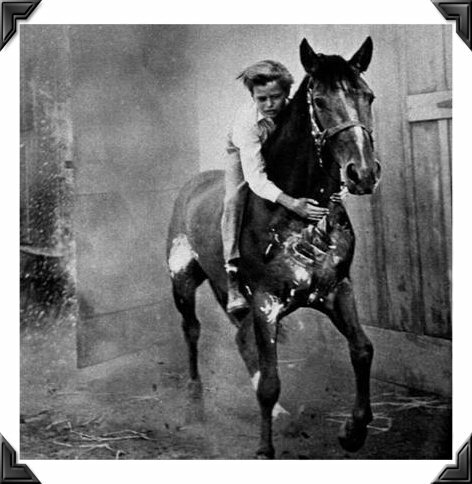 One such horse she saved was Midnight—the horse that Clint Eastwood had ridden in the Rawhide television series as his character Rowdy Yates. When Martha began her career in stunt work, she was one of a small handful of ladies who dared perform that kind of work, and they pretty much did it all anonymously so that the stars themselves would get the credit. Few outside the motion picture industry knew of their hard and dangerous work and sacrifice. Martha was inducted into the Hollywood Stuntmen’s Hall of Fame in 2004, and was a Golden Boot Award Honoree in 2005. 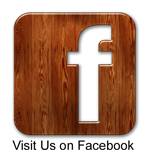 She currently lives in the Okanagan Valley in British Columbia, Canada with her husband John, who is a retired jockey. 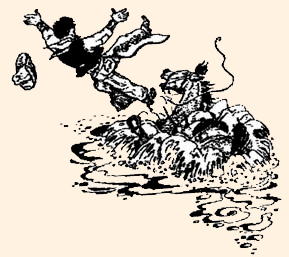 Stunt work is a perilous business that requires a great deal of skill and experience. Those who take it up and are successful are a tough hard-working bunch, constantly brushing with danger and often sustaining injuries during their day-to-day work. Sometimes those injuries prove fatal. Just think of the amazing acts you’ve seen at the circus—film stunts require the same daring, skill, and constant repetitive practice! The stunt community is perhaps the most macho of all the Hollywood industries—with the highest unemployment rate to boot. They’re not constantly on the set earning money—they show up when there are particular stunts to perform. The more stunts in a film, the more work they have. The studios usually will not allow most actors or actresses to perform their own stunts (even if they could) due to insurance liability and the fact that if the leading actors are injured it will hold up production indefinitely. Stunt people have always been an invaluable and integral part of film-making, and those like Stephanie and Martha, who specialize in working in the equestrian stunt field, are—-like their horses—a very special breed! Their work was another unique feature that made My Friend Flicka such a classic television series. 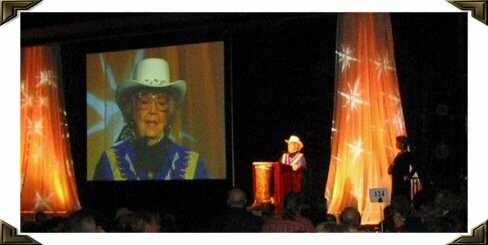 Martha Crawford-Cantarini, giving her acceptance speech at the 2005 Golden Boot Awards. 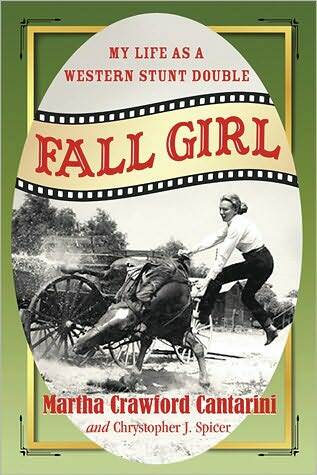 Martha Crawford Cantarini's biography, Fall Girl: My Life as a Western Stunt Double, which she wrote in collaboration with Chrystopher J. Spicer, was published by Barnes & Noble in May of 2010. If you are interested in films, stunts, or horses, Martha's book is a "must read."